So let’s tackle the Why, the Who Cares, and the So What of these tidings. I don’t need to really discuss why the Rocket came back. The best always want to play until they fall apart. Ali did it, Jordan did it, and Favre is doing it right now. What I want to really get into is why the Rocket came back to the Yankees. Roger Clemens will be making a pro-rated $28MM salary this year, which works out to roughly $18MM for the four months (assuming he starts throwing at the beginning of June) that he’s in uniform. That’s nearly double what the Red Sox were offering for a late June start date and, based on the Astros’ spending trend, higher than Houston’s offering by about a billion dollars. So was money the difference? Not entirely. But I do think an offer that gives him the highest per-game salary in the history of baseball was a vital first bean in a three bean “Welcome to the Bronx” salad. The second bean was the people in the Yankees organization. They always say that co-workers make the job. Not as much as a salary twice as high as any other you could get, but still an important note. 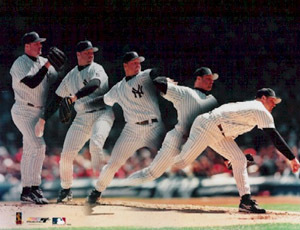 It is public knowledge that Andy Pettitte and Clemens are two peas in a pod. Derek Jeter, whom he has gone on record multiple times to praise, and Jason Giambi have been keeping in touch with him all season. And George Steinbrenner had a private conversation with him in the spring that Clemens noted was very special to him. So while all of this may not be as important as the amount direct deposited into his account each month, it cannot be discounted. That third bean is the answer to the question “What Do You Get a 44 Year Old Future Hall of Famer That Has Everything?” Simple – a God complex. Clemens has seven Cy Young awards, a pair of World Series Rings, over 4,600 strikeouts and is in the top ten in career wins. But he’s never been a savior before. Last year’s tour in Houston didn’t result in a playoff berth and my guess is that he figured his return wouldn’t do it this year either. Boston is already on top of the division, so it’s not like they need (or the media says they need) rescue. The Yankees are a special case, though. They’re one game below .500 (14-15), yet are leading the league in runs per game (6.0). They’re a team that is betrayed by non-Wang, non-Pettitte starting pitching. If only there was a man that could ride into town on a white horse to right the wrongs! If the Yankees can turn things around (my guess is that they were going to even without the Rocket), it’ll be this 7th inning announcement last night that will be marked as the turning point of the season. Being a season-saving hero is not a bad way to end a career. Yankees fans love to give ovations. If Jeter works the count full, 55 thousand will get up and holler in appreciation of the Captain bringing up the opposing hurler’s pitch count. But last night, the noise was defeaning. It was a complete surprise, masterfully kept from the baseball pundits. And the reaction in the Bronx last night showed that. Clemens is going to be embraced as a hero by the fans even before he starts getting Ks. The critics may call him a man without a city, but it doesn’t much matter to the New Yorkers buying tickets and the millions that watch YES. This move gave the fans hope. If the Yankees stay at a .500 clip for the rest of May in preparation for Clemens, the fans would still cheer and hang on to a belief that the Yankees are playoff bound. That “anything’s possible” feeling will keep the stadium full regardless of how the team (within reason) does. For the next month, the Yanks are just keeping the mound warm for him. In the churning conflux of sound that is Boston sports media, the hating is whipping around in a gale. In the all-business, crap-eating grin sports media of New York, they’re already suggesting buying playoff tickets. As a man with pinstripe boxers living in the Commonwealth, I’m going to try to straddle line. 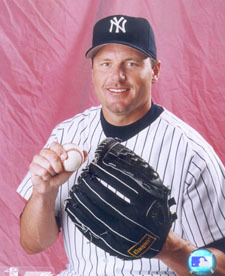 Roger Clemens is a 44 year old ballplayer that doesn’t pitch a workhorse number of innings anymore. His velocity is down and his control is bound to slip eventually. He’s also costing the Yankees $25 million ($18MM in salary and the rest in luxury tax). That’s the argument against, and all of it is certainly valid. But for the Yankees in this very moment, he’s still vastly better than any of the other options. An unquestionable upgrade. Sure, 44 is old. But so was 43 and he had a 2.30 ERA in over 100 innings. Granted, it’s the National League, but even if we bump his ERA to an even 4.00, it still undercuts Kei Igawa’s by 3 and a half. In terms of his innings pitches, he averaged 5.94 Innings per Outing last year (113 IP in 19 Starts) and 6.6 the year before. I’ll take that over Jeff Karstens. If the bullpen is only responsible for 3 innings a night when the Rocket is on the hill, that’d be a much better situation for Scott “My Day Isn’t Complete without getting 4 outs” Proctor and the rest of the ‘pen than they have currently. The velocity is down, but he’s still topping off in the low 90s and not afraid to throw a high fastball to set up that diving splitter. The fact that he’s averaged only one baserunner an inning for the past two years is some indication that he’s still able to control the game with his diminished tools. And in regards to money, well, the Yankees would much rather spend cash now than spend cash and prospects to trade for someone later. 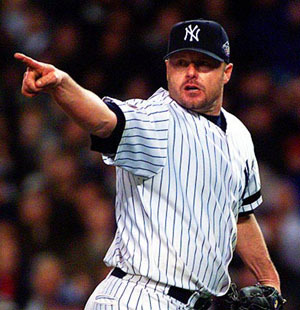 Roger Clemens is a one year fix. Chien-Ming Wang and Phil Hughes will most likely be the anchors of the staff next year, and perhaps some other young talent may emerge from a refreshingly well-stocked minor league system. And, if my hunch is right, Johan Santana is going to be leaving the Twin Cities on a midnight train for the NYC suburbs in 2008. He’s old and he’s expensive. Truth. But he’s been throwing on a pair of durable legs that have held up for two and a half decades, costs nothing more than no-strings-attached money, and can still get outs. Start spreading the news. A knight’s riding in.